If you've recently switched your phone number, email address, or postal address, it's a good idea to update the contact information associated with your domains. Please note that you can use Bulk Manage to update the contacts on multiple domains at once, or skip to step 4 to update your account (default) contact information. Locate the domain you wish to update. Click the drop-down list to the far right of the domain name, then locate the section that says "Domain Contacts". Select the "Edit" option. A pop-up window should appear with your current contact information. Update your contact information and hit Submit. If you need to set up contact types individually, click "Set each contact type individually" and tabs will appear at the top of the popup window allowing you to set each field individually. This is useful for situations where the domain's owner aka "Registrant Contact" or Administrative Contact is different than the Technical or Billing contact. If you wanted to update every domain in your account with this contact information, click "Update all domains in account with this contact information." Please note that selecting this checkbox will update your default contact information as well. If you haven't already, now is probably a good time to update your default contact info. 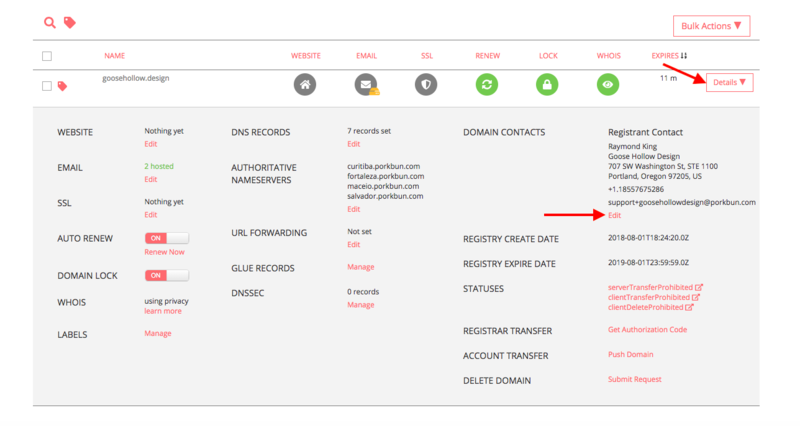 If you register additional domains, their contact information will be pre-populated with the data from your default contacts. To do so, click your username in the top-right corner and select Account Settings. In the leftmost column, underneath Billing Information is your default contacts. Click any of the pencil icons to update your Default Contacts.